The Rolex Milgauss is one of those watches from the brand that occupies something of a second-tier position in the catalog. 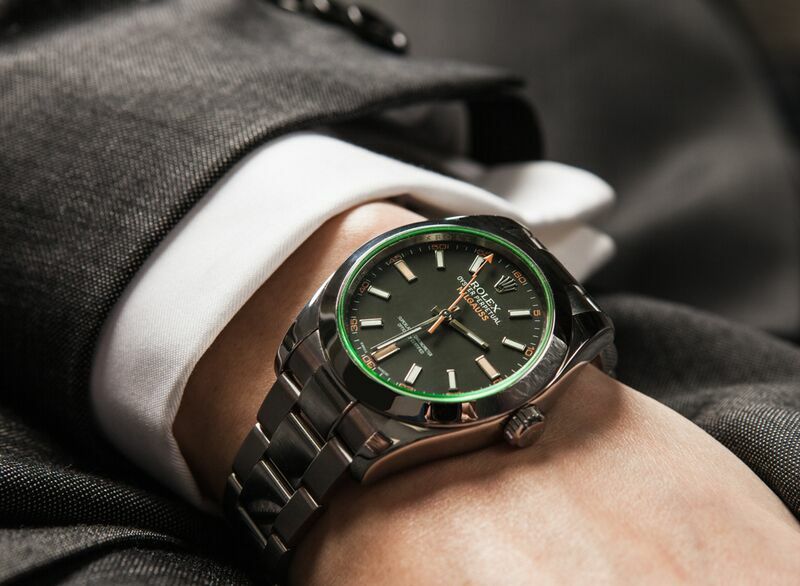 If models such as the Submariner or the GMT-Master or the Daytona are the popular kids—the jocks and the prom kings—then the Milgauss model is much more chess club. It is a watch for serious professionals rather than a sports piece and as such it has never competed in the popularity stakes with those created for more glamorous lives. It has always been quiet and unassuming but highly capable, favoring substance over style. 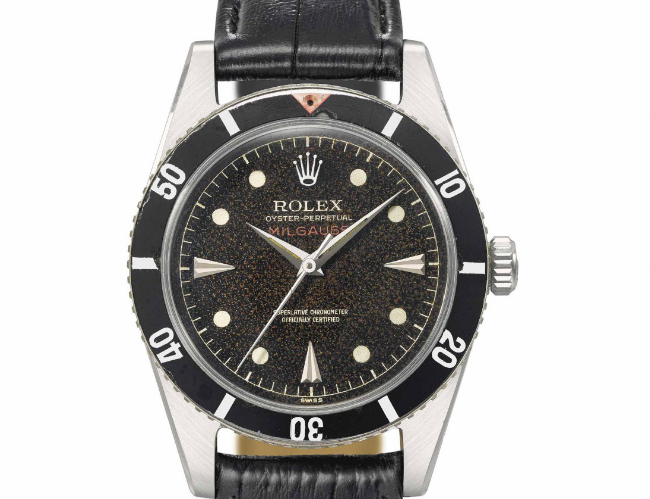 Like several others in the Rolex family, the Milgauss was built out of necessity. 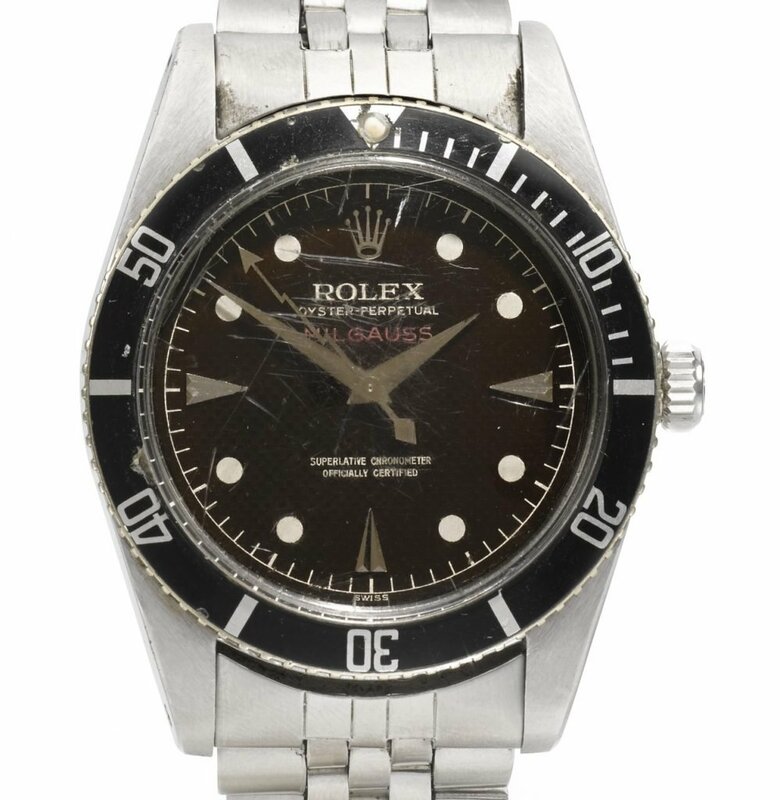 It started life in 1954, at the dawning of the atomic age, and one story of the model’s origins has scientists at CERN, the European Organization for Nuclear Research, contacting Rolex directly to request a watch they could wear safely as they tried to unravel the secrets of the universe in the world’s highest energy particle accelerator. Whether or not it’s true, and there is very little evidence of it, it isn’t out of the realms of possibility—it is, after all, a similar story to how the GMT-Master (Pan-Am) and the Sea-Dweller (COMEX) came to be. The problem CERN boffins were encountering, as were many other scientists, engineers and medical professionals working at the cutting edge of new technology, was electromagnetic fields. High strength magnetism, as you would experience regularly in any of those occupations, can bend and distort the miniscule internal components of mechanical watches. In fact, prolonged exposure to a force measuring just 50-100 gauss (the strength of a fridge magnet) can render an unprotected caliber useless. 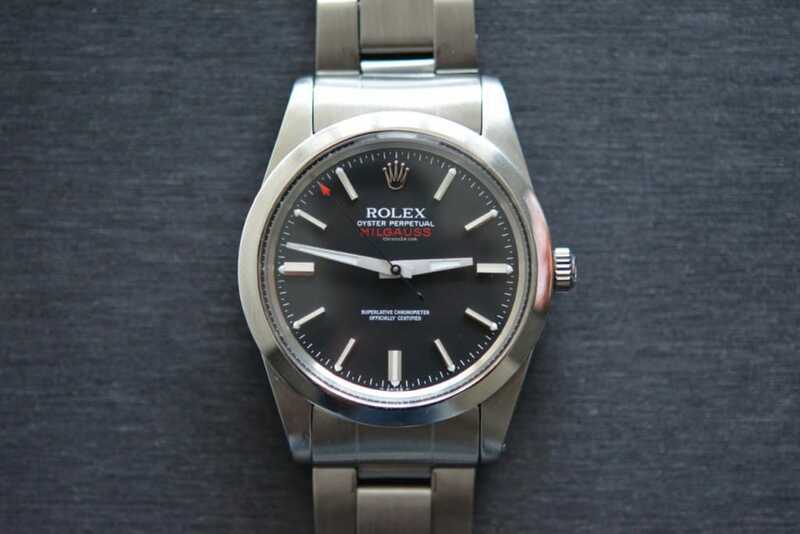 Rolex’s solution was to shield the Milgauss’s movement inside a second case, actually a soft iron Faraday cage, that redirected the magnetic energy away from the mechanism. The first reference of their new piece, the ref. 6543, was indeed tested by CERN and found to be resistant to up to 1,000 gauss, and gave the watch its name; mille being French for a thousand and gauss the unit of magnetic flux density. That model, which was little more than a prototype, bore an uncanny resemblance to the recently released Submariner save for a distinctive honeycomb-style dial. The twin layers of metal mesh added an extra level of protection. The ref. 6543 was produced for less than two years, with manufactured numbers totaling somewhere around 150, before it was replaced by its successor the ref. 6541 in 1956. This too shared many of the design details of the Sub, with its black rotating bezel and steel 38mm Oyster case. But those madcaps at Rolex did add one zany flourish to the Milgauss to distinguish it from the diver’s model. In reference to its impressively defiant abilities, the seconds hand turned a lightning-bolt shape. 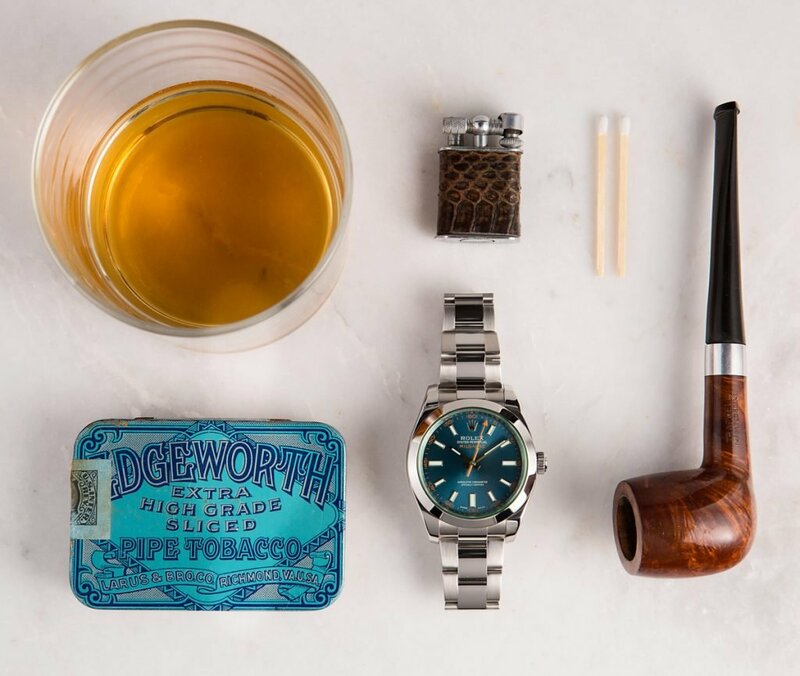 While the watch remained an underwhelming seller throughout its history, that particular quirk became a recognizable characteristic of the name. But not for long. The ref. 6541 was itself retired just four years later and superseded by the long-running ref. 6019, a reference that departed entirely from the watch’s established design language. Gone was the rotating bezel to be replaced by a smooth polished surround, the black honeycomb dial was lost to a plain matte one and the jagged seconds hand reverted back to a standard straight, red-tipped affair. For the first time, the Milgauss was offered in a range of options, limited though they were. Buyers could take their pick from models with either a black or a silver face, along with another version that was most definitely requested by CERN specifically; a silver dial with no lume. The tritium Rolex was using at the time, although far safer than the previous radium, was still slightly radioactive and so would interfere with the extremely delicate equipment the scientists were using. The so-called CERN dial models, with all lume stripped from hands and hour indexes, are among the most sought after examples of vintage Milgauss. By 1988 it became clear there just weren’t enough eggheads in the world to sustain the Milgauss as a viable concern. With sales figures consistently disappointing, particularly in comparison to some of the brand’s big hitters, the watch was retired. Although it seemed that was that, Rolex surprised everyone 19-years later when they released the Milgauss for the 21st century. The ref. 116400 was unveiled at Baselworld 2007, a watch that fitted in nicely with the brand’s contemporary aesthetic but still had one or two nods to references of the past. The dimensions had increased to 40mm in keeping with much of the rest of the tool watch family, and it was forged from the usual 904L steel, the insanely tough alloy used almost exclusively by Rolex. It still used the soft iron cage to protect its movement, but the hairspring and the escape wheel in the Cal. 3131 were now made from naturally paramagnetic materials as well, upping the resistance still further. The bezel remained the smooth, polished type from the previous ref. 6019, but most importantly to fans of the original, the electric seconds hand was back and this time it came in bright orange. Those initial models came with either a black or white dial, covered with a clear sapphire crystal. A short while later, the ref. 116400GV was released, the GV standing for Glace Verte. This time, the crystal was given a beautiful green tint, involving a technique so complex that Rolex, which owns more watch-related patents than just about anyone else, didn’t even bother to register it as they knew no other brand would be able to master the process. In 2014, they doubled down on making the Milgauss the most vibrant model in the range when they replaced the white dial version with the Z-Blue, a truly eye-catching piece with an electric blue dial coated in Zirconium. The Milgauss now holds an almost unique place in the history of Rolex. Where with other watches created around the same time, and even before (Datejust, Day-Date, practically the whole of the sports series) you can stand up the initial reference next to the modern day example and see nothing but a very gentle evolution at work, with the Milgauss, the first and the last bear practically no relation to each other. It has always been the outsider, a design that doesn’t scream Rolex like some, and is all the more interesting because of it. Constantly underrated and outsold throughout its history, the Milgauss is the brand’s most colorful black sheep.